Eco-friendly waste depot on Jalan Inspeksi Kali Sunter, RW 09, Rawa Badak Utara, Koja, North Jakarta which is built using PT. Pertamina's Corporate Social Responsibility (CSR) fund is officially operated today.
" Waste collecting time will be scheduled from afternoon to night"
Koja Sub-district Head, Yusuf Madjid mentioned, this depot can accommodate waste from 903 RTs in six urban villages of Koja Sub-district before it is transported to Bantargebang. Waste collection in each RT/RWs will be scheduled to prevent it from pilling up. "Waste collecting time will be scheduled from afternoon to night. Then we will transport it to Bantargebang around night to morning," he said at the location, Friday (12/14). He mentioned that waste collection schedule had been socialized to residents even before waste depot construction is completed. "Former depot land is now used as parking lot. The new depot has been handed over by Pertamina. We will operate it this afternoon," he added. On the same location, PT. 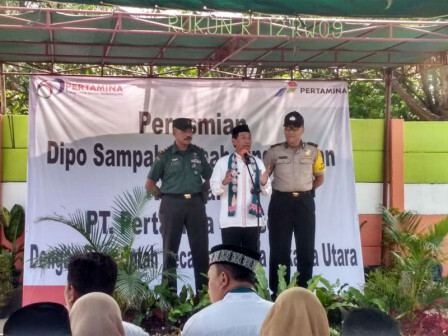 Pertamina Jakarta Fuel Terminal Operational Head, Budi Prasojo explained, around 17x15 meters of total 510 square meters land is made into permanent eco-friendly waste depot. "We also provide sewage treatment pipes thus it will not cause unpleasant smell. Hopefully it can be useful for the residents," he conveyed.